Monday was a special father/son bonding day. Microsoft doesn’t have the day off, so it was just me and the boys. I decided to celebrate by taking the kids back to the Point Defiance Zoo and Aquarium. Our last trip there was a little over three years ago, which is just so odd to recall. In my memory of that day, Alex seems so old, yet he was younger then than Patrick is now. Memory plays odd tricks, I guess. As the eldest, Alex will likely always seem old in my memories, and my mind will always refuse to accept that Patrick is growing up at all. 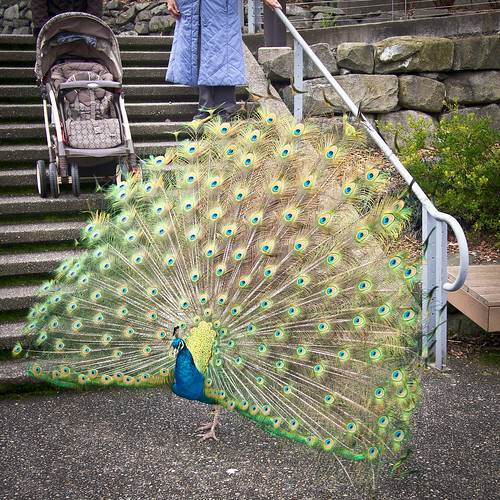 One nice thing about our trip to the Point Defiance Zoo is we actually saw animals. That may seem an odd thing to say until you tag along with our family on one of our trips to the Woodland Park Zoo in Seattle. The kids now have a routine that involves remarkably little animal watching. They love getting the kids’ mac & cheese meal at the Rain Forest Pavilion (it is remarkably good mac & cheese). Then they head over to the Zoomazium for a good twenty minutes of climbing and sliding. We always have to drag them out of there to see the animals. 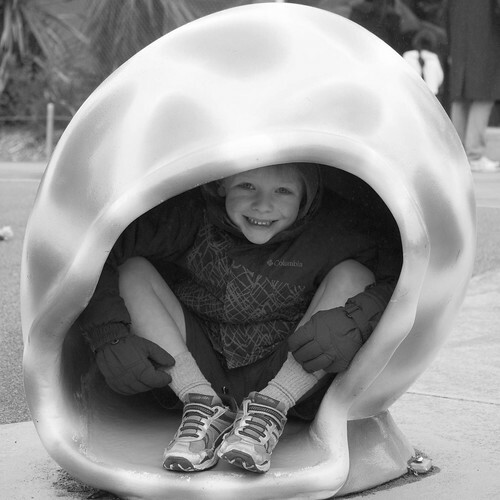 …and Patrick found a kid-sized nest and transformed into a baby bird. 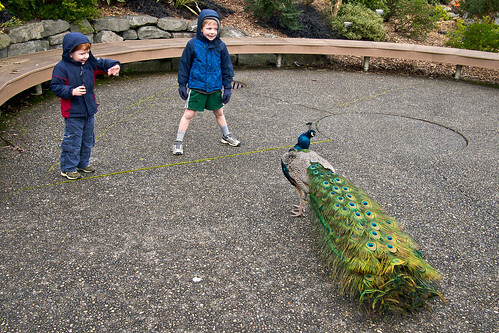 He spent the rest of the zoo visit flapping his arms like wings. The walruses were amazing because they were so big yet so graceful in the water. (The zoo’s male walrus weighs over 3000 pounds!) It was hard to pull Patrick away from the underwater viewing area where he watched these giants glide silently past, over and over. But the real stars of our visit were the polar bears. By pure luck, we got there just as the zookeepers started feeding the bears. Instead of watching white furry rocks sleeping, we got to see the ten-foot-tall bears swimming through the water to catch their fish, just inches from our faces. It was the coolest thing I’ve seen at a zoo in a long time. Serious Patrick, originally uploaded by B.K. Dewey. 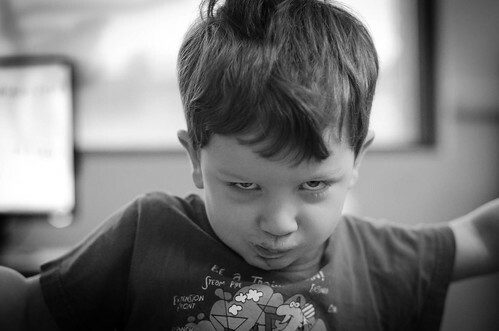 A picture from Patrick’s Valentine’s Day party at preschool. I’m not sure what this expression was supposed to be, but it was my favorite. I think it could be an album cover someday. I’m not quite sure why he decided to roar at me. 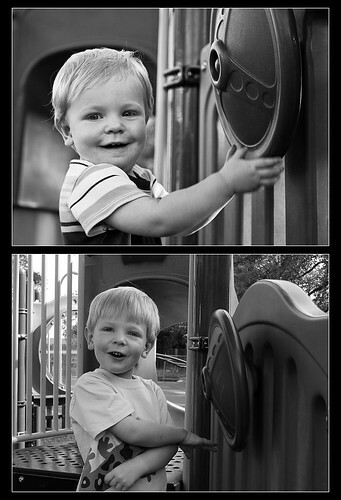 It was a memorable trip to the playground. First, it was only myself and Patrick. It was near the end of the day, and Alex didn’t want to go outside. Alex chose to stay in and read Raz-Kids on the computer instead. I’ve grown to think of the two of them as inseparable, and it’s strange for me to be with just one of them. Second, this was Patrick’s first trip out on his wooden balance bike. He loved it (although he was doing more walking than riding). Finally, this is the first time I’ve realized: Patrick’s finally gotten fast! 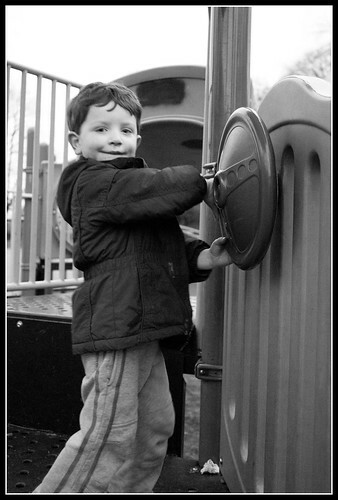 As a toddler, he wasn’t as graceful a walker as Alex, but he’s now got the running thing down. 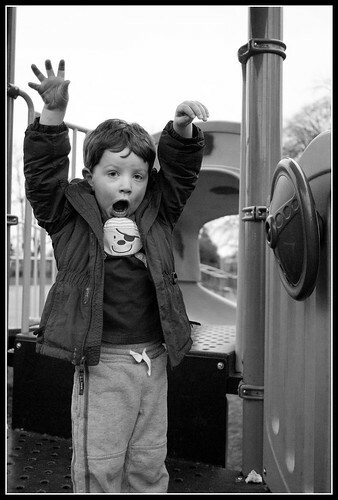 He spent most of the playground time running around the grassy field. A family was also out on the field kicking a soccer ball around. As you know, Patrick has an eye out for the ladies… he spent half of his running time orbiting a sixth grade girl and just soaking up the attention she gave him! This was the conversation in the back of the car as I drove the kids to school this morning. A: Now, put it together!